Click here to see the Japanese version of the cover. I co-authored this book with Aaron Cohen. It focuses on designing, developing, and debugging solid multithreaded applications in Win32. 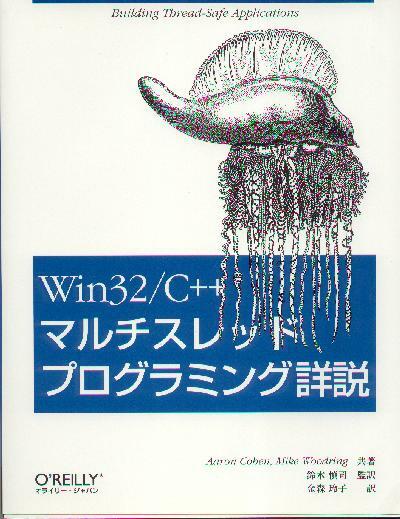 The book discusses the fundamentals of multithreading using the Win32 API, explores more advanced threading techniques, and transitions into the use of C++ to facilitate multithreaded programming. Although this book focuses on systems programming, a couple of chapters are devoted to exploring the use of multithreading within user interface-based applications, including MFC's support for multithreaded applications. A light-weight class library for multithreaded programming is developed throughout the book and is included on the CD that accompanies the book. O'Reilly & Associates home page for Win32 Multithreaded Programming. Copyright (c) 1998-1999 Mike Woodring. Last revised: July 28, 2000.